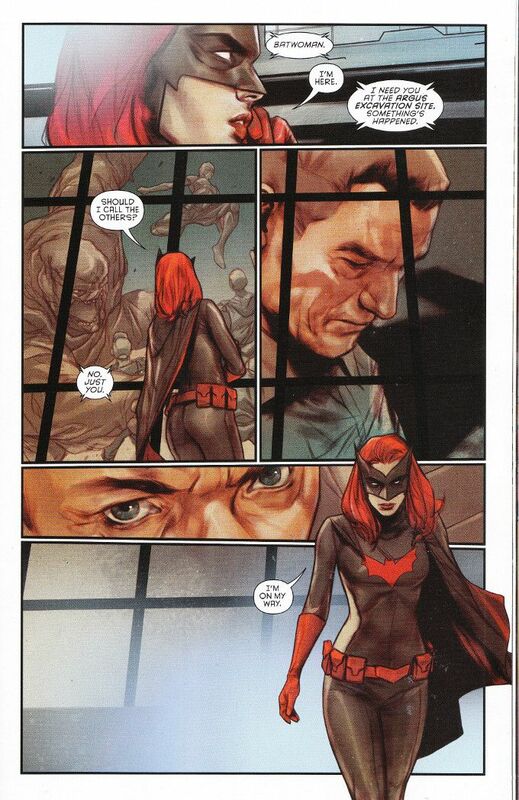 In the aftermath of The Victim Syndicate's attacks and The Spoiler's departure from The Belfry Team, Batwoman seeks to rebuild. It's hard to move on when the past keeps resurfacing, however, and Kate Kane is about to get a double helping of enemies returning to settle old scores. First, when The Monster Men seem to reemerge and again when one of her father's allies from the paramilitary Colony attack her and Batman! Marguerite Bennett - writer of Red Sonja and Bombshells - lends a hand on the writing duties this week. This is no bad thing, however, as James Tynion IV and Bennett play well off of each other and the story here is not an abrupt departure from the direction that Detective Comics had been moving over the last few months. The tale here is gripping and enjoyable beyond serving as a set-up of the upcoming Batwoman series, which will see both these writers teaming up once again. Ben Oliver's artwork here is unusual for a Bat-book, boasting a unique style that is gently inked and softly colored. There is little in the way of solid black in either the outlines of the characters or the coloration, even on things that are traditionally depicted as being pitch black such as Batwoman's costume! This gives the artwork a greater sense of detail that catches the eye and sticks in the memory once the book is closed.